As more people are becoming pet owners, there is an increase in the need to control odors from those pets. This is one of the most annoying problems to deal with because of the recurrence of the odor. This can be dealt with by a detailed plan of attack. Depending on the severity of the problem, we will approach it with the goal in mind of the total removal of the problem. It may be necessary to only clean the top of the carpet with special treatments, or it may be necessary to clean all of the way to the floor. The problem areas will be investigated and we will discuss with you the best possible options available. We have found this to be the most annoying problem for people in your position. Many other cleaners claim to be able to deal with it, yet fail. 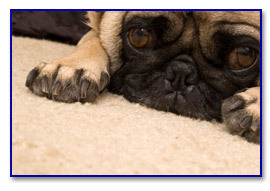 We at Affordable Clean Carpet Service have the knowledge and the ability to guarantee our work in this area. Since our service is exclusive, we will come to your property to discuss specific problems.